Have you seen this new book from the author of Prairie Children and their Quilts? Kathleen Tracy has come out with The civil War Sewing Circle book - Quilts and Sewing Accessories Inspired by the Era and was a gem it is. There are so many projects I could make out of that book! 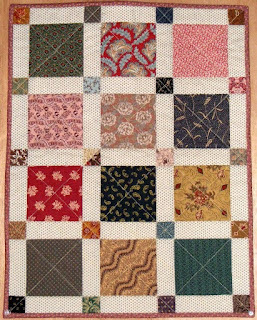 As a matter of fact, I have recently completed a small quilt from that book! This cute little doll quilt is called Scrap Square Doll Quilt! Except for the sashing, I used all scraps to make it! Thanks you for stopping by! Keep well! I recently purchased this book and it's wonderful. Love your first project - very sweet, indeed. I don't have this book yet. Your little quilt is darling. I made one of the signature blocks that is now in the book. Oh sure. Another book I NEED! Your little quilt is so cute! Thanks for sharing and taking the time to email me. For some reason this quilt (Soldier's Cot Quilt)calls to me...make me, make me. So I will! Half Square Triangles..... a tutorial....! Stintchin' fool..... the stitch goes on.....! Quilting and SNOW DAY .........!